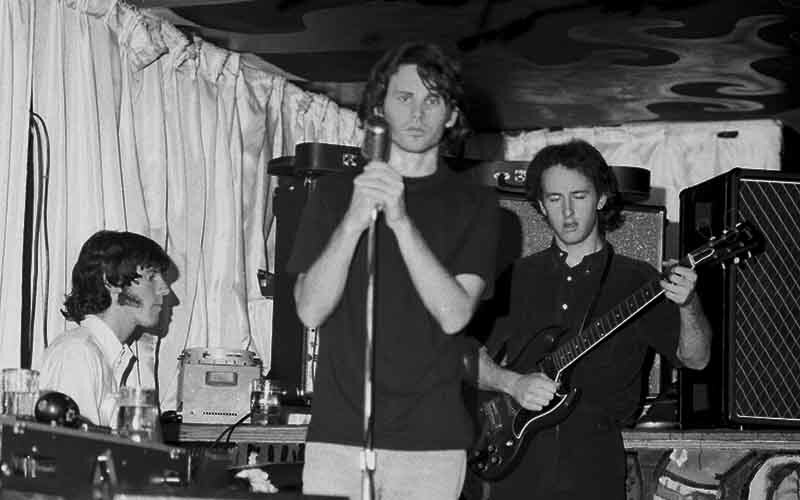 The Doors spent the 1960s haunting favorite spots on the sand, but they also roamed Laurel Canyon, West Hollywood, and downtown. Many of their hangouts still remain popular, so follow our lead and live like a Door for a day. This budget motel was already decades old when Morrison and his friends commandeered room 32 throughout the late 1960s. Today, fans have filled the room with graffiti and artwork honoring their heroes. Rooms rent for about $80. The classic dive mounted a bronze plaque in honor of Morrison in 2008. It was signed by his bandmates and marks his favorite spot at the long wooden bar. The future of the 97-year-old restaurant is uncertain. The band spent the summer before their first album was released performing as the house band at this Sunset Strip nightclub. They opened for Buffalo Springfield, Love, and The Turtles and performed two sets a night between May 23 and August 21, 1966. This 103-year-old downtown hotel was already down on its luck when photographer Henry Diltz sneaked the band into the lobby and snapped their iconic album cover in 1970. The folks behind the swanky Dream Hotel in Hollywood are currently renovating the long-closed lodging. Doors producer Paul Rothchild remembered that the lyrics to the 1968 hit “Love Street” (“She lives on Love Street / There’s this store where the creatures meet”) were inspired by Morrison’s visits to the market with girlfriend Pamela Courson. When photographer Henry Diltz was finished shooting the band at the Morrison Hotel, Morrison wanted to go drinking on Skid Row—where there were then numerous bars, including the Hard Rock Café where Diltz took some additional photos. His images of the band have become photographic icons. The building at the corner of 5th & Wall Streets was built in 1905 as a dental college. The bar is long gone and today the space is a market and deli. The origin story of the Doors takes place in Santa Monica where Ray Manzarek spotted Morrison walking on the beach. The stretch of sand between the pier and Venice was a favorite walk for the pair of UCLA film students. Today, you can take a guided bike tour of the band’s history there.